Dr. Subhash Bhamre, the MoS for Defence inaugurated the first ECHS Polyclinic in Tawang, Arunachal Pradesh. 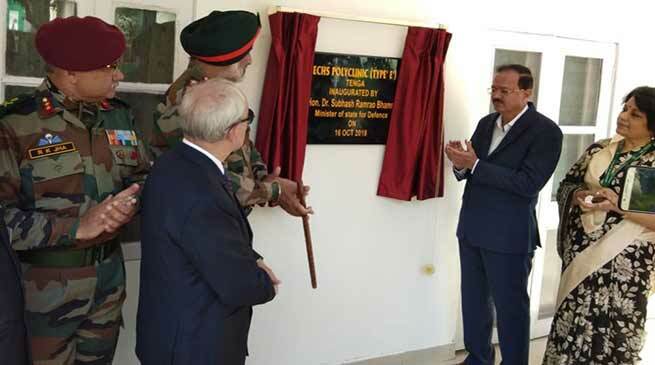 Dr. Subhash Bhamre, the MoS for Defence inaugurated the first Ex-Servicemen Contributory Health Scheme (ECHS) Polyclinic in the remote high altitude area of Tawang in Arunachal Pradesh. Lt Gen GS Sangha, SM, VSM General Officer Commanding Gajraj Corps alongwith Major General R K Jha, General Officer Commanding, Ball of Fire Division and Brigadier Zubin Bhatnagar, Commander of Tawang Garrison were also present at the event along with officials from District Administration and large number of Ex-Servicemen of Tawang and adjoining areas. The ECHS Clinic in Tawang was a long pending dream of Ex-Servicemen in Tawang District which had witnessed fierce battle with China in 1962. The scheme will provide quality medical care to all Ex-Servicemen, their widows and authorised dependants of Tawang who could not travel up to the nearest ECHS facilities located approximately 350 Km away at Tezpur and Guwahati. This Polyclinic will also act as a nodal point for treatment of veterans in the empanelled super speciality hospitals in major cities of India. The minister also addressed the gathering and highlighted various welfare measures being undertaken by the Government for Ex-Servicemen. He also had a hearty and frank interaction with them later during a tea organised by Tawang Brigade for the complete gathering. Tawang being located in a remote high altitude area along the sensitive Line of Actual Control (LAC) with China has limited medical facilities in the form of one heavily subscribed District Hospital and five Primary Health Centres (PHC) in the entire district. The medical and surgical specialists of the Army Hospital at Tawang and Tenga will also visit the Polyclinic regularly to provide specialist care to Ex- Servicemen. Dr Subhash Ramrao Bhambre also dedicated the first ECHS polyclinic in Tenga, a vital step in better healthcare for the veterans. This will not only help the Ex-servicemen and their families to directly access super specialty health care services of private hospitals in Arunachal Pradesh and neighbouring states, but also improve the health care for the veterans in Arunachal. The local Army Hospital at Tenga has also come forward to help the ESM by providing the hospital infrastructure and nursing staff including a Doctor to run the polyclinic. The RRM in his interaction with the ESM and their families assured continued support and commitment of the govt in further welfare of the ESM. He also lauded the commendable commitment of the govt in further welfare of the ESM. He also lauded the commendable humanitarian work carried out by MH Tenga in treating civil patients in their hospital and expressed gratitude at the efforts taken by Army in upliftment of the local population.